In this paper we present a case of microbiologically influenced corrosion interesting several stainless steel storage tanks of a sugar Refinery. An accurate visual examination of the damage morphology, together with a long experience in failure analysis permitted to recognise the bacteria attack to be liable for damage. This hypothesis excluded other corrosion phenomena typical of stainless steels. The microanalysis results obtained on the deposits taken from the surface of the storage tanks confirmed the original hypothesis. 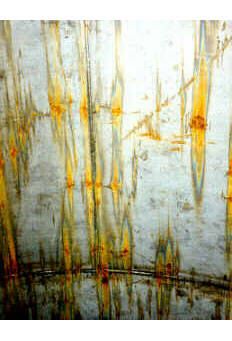 Further metallographic examination by replica technique excluded the presence of stress-corrosion and allowed a feasibility plan for repairing the tanks. The case, discussed together with technicians of a sugar refinery in Saudi Arabia, concerns a corrosion phenomenon that interests stainless steel vessels. At the beginning this phenomenon was considered as chloride corrosion on the ground of experience. This interpretation was also justified as the vessels were placed in a seaside environment. It was requested to determine the type of damage, the stress corrosion phenomenon and the metallographic conditions because of its importance and extension. The results obtained from the examinations had to establish the possible remedies for keeping the vessels in working conditions. Two initial phases (for the definition of the phenomenon and the type of metallurgical damage) and two final phases (subordinated to the initial results that are linked to the surface neutralisation, in order to stop the corrosion phenomena and to the rehabilitation of the most important corroded areas) were planned. Metallographic Examination by Replica Technique. 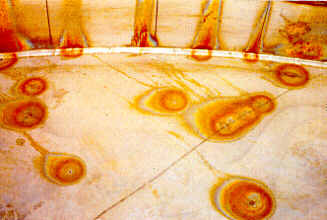 The surfaces affected by corrosion phenomena were located between a top line at 30÷80 cm from top cover and the circumferential seam connecting shell to bottom (Fig. 1 and 2). The aspect of the corroded areas is generally similar to two vertical compass needles (streaks) having the edges in opposite positions and having the core-origin of pitting corrosion - in correspondence of the top edge of circumferential seams. 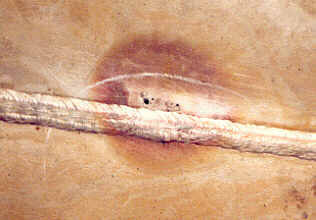 Additional vertically pitted areas have been visualized in correspondence of superficial incisions, welding circumferential joints and welding anomalies. Top borders of areas including corroded surfaces corresponded exactly to the highest level reached by water during hydrostatic test of vessels. In the upper parts of the shells (from the highest nozzle up to cover plate) the surfaces were clean and integer. The areas affected by pitting corrosion phenomena (Fig. 3 and 4) were spread at random on the plate of the bottom head. They were covered by corrosion deposits having a crest in correspondence of the origin of pitting; the average diameter of corroded zones was about 50 mm; the central height of the pit was in the range of 1÷3,5 mm. 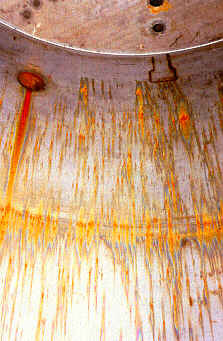 Non destructive examinations were performed on two of the corroded vessels. Depths of 4 pit centre lines were obtained as difference between the actual thickness of uncorroded plate (A), in the surrounding of each test point, and the plate thickness of the pit centre line measured after grinding (B). 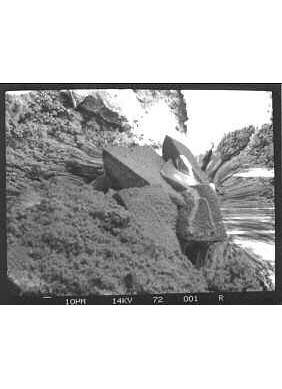 Non destructive metallographic examinations of some corroded and uncorroded zones were carried out by "reflective metallographic replica" method according to ASTM E 1351/90, in order to verify the presence of carbide precipitation in the microstructure of base materials, welding beads and heat affected zones (H.A.Z.). The growth of microbacteria on the plates was explained only assuming that microbacteria had been in the water used for hydrostatic tests of the vessels and they were not perfectly dried after test completion. This assumption was confirmed by the absence of corroded areas above the maximum water level during hydro test. Microbacteria's metabolism produced acid secretions that damage the passivating oxide film and their accumulation led to a shield effect respect to the adjacent areas. The surface of AISI 304L plates was then locally exposed to anodic corrosion with consequent "pitting" effects and accelerated dissolution of the base material inside the pits. Fig 5: Typical SRB's products. Fig 6: Products spectrum. Remedial works were calibrated in accordance with the actual characteristics of the corroded areas and therefore the steps of the procedures to be used on shell and bottom for restoring a homogeneous passivating film of metal oxides on the surfaces were partially different. Soft grinding of all corroded areas by stainless steel grinding disk. Rinsing of the surfaces using demineralized water properly treated. Water injected onto the plates with a H.P. water launcher. Final controlled drying of the surfaces by blowing air with an air fan. Filling the ground areas with additional metal using approved welding procedure. Grinding of surplus welding materials. Dye penetrant liquid examination of weldings. Pickling-passivation (as in previous paragraph). Rinsing (as in previous paragraph). Final drying (as in previous paragraph). On the plates, treated in accordance with the producers of par. 5.0 and with the specified water, the passivating metal oxide films was restored to a status equivalent to the original one, so that the corrosion phenomena was permanently stopped.